The U.S. consumer price index rose 0.5% in February from the month before, pushed higher by food and energy costs. The price index for all items climbed 2.1% over the past year. But many think government-reported inflation numbers don’t present an accurate price picture. Some economists estimate the true rate of inflation is closer to 8% or 9%. And those numbers could rise higher as the U.S. Federal Reserve continues to pump billions of dollars into the financial system. Inflation, coupled with political turmoil in the Middle East, has pushed many investors out of stocks and into commodities. Gold rose to a record $1,445.70 an ounce on March 7. Market uncertainty from the Japan disaster pushed the metal down to $1,380.70 on March 15, but it gained again this week to hover around $1,400 an ounce. A dramatic increase in inflation this year could push gold prices even higher than predicted as more investors seek safe haven investments. Many predict gold will continue to climb and reach $2,000 an ounce, or higher. China is one of the countries flocking to gold. The country’s inflation risk pushed its investors into a gold buying spree last year. Chinese demand for gold bars and coins reached 180 tons in 2010, up a whopping 70% from 2009, Albert Cheng, the World Gold Council’s managing director for the Far East, said at a news conference last month. Now Japan’s economy will contribute to the gold rush. In the wake of Japan’s disaster, the Bank of Japan (BOJ) will pump more money into the financial system. The central bank poured a record $183.17 billion (15 trillion yen) into money markets Monday and doubled the size of its asset-purchase program to ease liquidity worries. 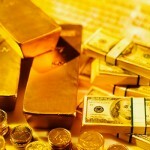 The money inflows will prompt more investors to seek gold investing to protect their wealth. The U.S. dollar’s continued fall will also support gold prices as investors protect against a weak currency. These gold price catalysts will continue to make the metal an attractive inflation hedge in 2011, although it may not see the same 30% price jump it had in 2010. The yellow metal struggled in January and concerned investors claimed its hot streak was slowing down. And even though gold gained this week, it’s not surging as high as expected during times of uncertainty as many investors are fleeing the markets altogether. But sitting on the sidelines during times of market volatility can mean missing out on huge gains. Investors nervous about putting all their money in gold can diversify their metals holdings with silver. Silver rose 83% in 2010 and is up about 16% so far this year. Some analysts call silver an even better investment than gold right now – and Money Morning Contributing Editor Shah Gilani agrees.